Since 1989, Ufology Research (formerly Ufology Research of Manitoba) has solicited UFO case data from known and active investigators and researchers in Canada. The goal has been to provide data for use by researchers trying to understand this controversial phenomenon. No comparable studies are currently produced by any other research group in North America. Similar programs exist in several other countries such as Sweden, where UFO report data is analysed by the Archives for UFO Research, and in Italy by Centro Italiano Studi Ufologici. 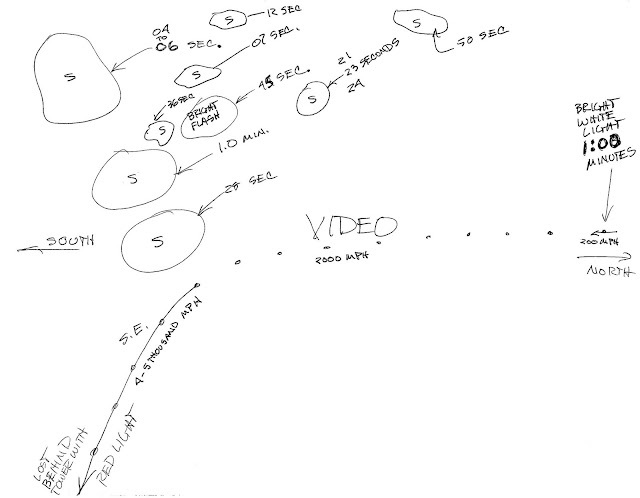 2012 marks the 24th year of collecting and analysing Canadian UFO report data by Ufology Research. · There were 1981 UFO sightings reported in Canada in 2012, or about five each day. This is more than twice the number of reports in 2011, when 986 reports were recorded. · The number of cases in 2012 completely eclipses the previous record for the highest number of reports in one year, when 1,004 reports were received in 2008. This represents literally a 100 per cent increase in the number of UFO reports between 2011 and 2012. · In 2012, there were record numbers of UFOs reported in all provinces except Saskatchewan and Prince Edward Island. Ontario had more than 40 per cent of all Canadian UFO reports in 2012, far more than previous years. · In 2012, about 7.5 per cent of all UFO reports were judged unexplained. This percentage dropped from 11 per cent in 2011. 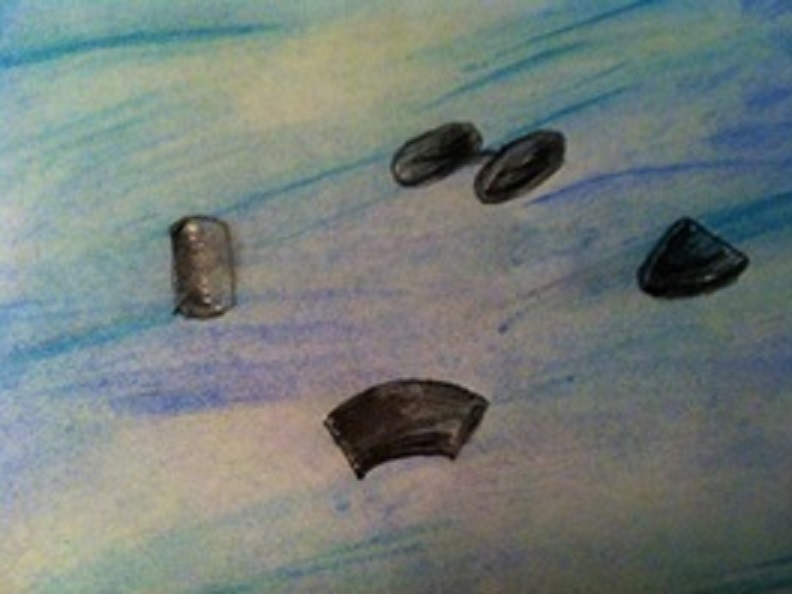 · The typical UFO sighting lasted approximately 15 minutes in 2012. Results of this study show that many people continue to report unusual objects in the sky, and some of these objects do not have obvious explanations. Many witnesses are pilots, police and other individuals with reasonably good observing capabilities and good judgement. Popular opinion to the contrary, there is no incontrovertible evidence that some UFO cases involve extraterrestrial contact. The continued reporting of UFOs by the public and the yearly increase in numbers of UFO reports suggests a need for further examination of the phenomenon by social, medical and/or physical scientists. The following table shows the number of reported UFOs per year since 1989, collected by Ufology Research. *― Data for 2009 has not yet been added to the database. The number of UFO reports per year has varied, although there has been a general trend towards a steady increase in yearly UFO report numbers over 24 years, peaking in 2012 with almost 2,000 reports in one year. Although there may be perceived notion that UFOs are not being reported with as much frequency as in the past, this is not true. UFOs have not “gone away.” This data clearly contradicts comments by those who would assert that UFOs are a ‘passing fad’ or that UFO sightings are decreasing. Data for each case was obtained by Ufology Research from participating researchers across Canada or through data mining of known websites devoted to UFO reports. The information then was coded by members of Ufology Research and entered into a database and statistically analysed. In 2012, Ontario had about 41 per cent of the total number of UFO sightings reported in Canada, the most reports of any province, and exactly the same percentage as in 2011. British Columbia was second, with about 20 per cent of the total. Overall, Ontario cases represent 31 per cent of all Canadian reports in the Ufology Research database, only slightly more than BC’s 28 per cent. If UFO reporting was simply a factor of population, one would expect percentages of 37 per cent for Ontario and 13 per cent for BC. Quebec should therefore have 23 per cent of all cases, but overall this percentage is less than nine per cent. In 2012, there were record numbers of UFOs reported in all provinces except Saskatchewan and Prince Edward Island. In addition, geographical names of UFO sighting locations were examined for trends. Many cities were found to have multiple reports, and these are noted in the following table. Large metropolitan areas include their suburbs. Monthly breakdowns of reports during each year tend to show slightly different patterns. UFO reports are generally thought to peak in summer and are at minimum in winter, presumably due to the more pleasant observing conditions during the summer months, when more witnesses are outside. In Canada in 2012, July and August numbers were again high, but report numbers were unusually high in the winter as well. An analysis by report type shows a similar breakdown to that found in previous years. The percentage of cases of a particular type remains roughly constant from year to year, with some variations. Proportionally, Daylight Discs dropped somewhat in 2012, with the lion’s share of cases still being Nocturnal Lights. Just over two per cent of all reported UFO cases in 2012 were Close Encounters, emphasizing the reality that very, very few UFO cases involve anything other than distant objects seen in the sky. This is an important statistic, because the current popular interest in abductions and sensational UFO encounters is based not on the vast majority of UFO cases but on the very tiny fraction of cases which fall into the category of close encounters. Speculation on what aliens may or may not be doing in our airspace seems almost completely unconnected to what are actually being reported as UFOs. The category of PH indicates the sighting was entirely photographic, without any actual object seen visually. Many reports listed as NL or ND or DD may also have associated photos or video, so this should not be considered exclusive. EV indicates a case in which physical evidence was observed (not necessarily related to any observed object) and RD is a case in which an object was detected with radar but not necessarily observed. UX cases are listed in the database, but not in the table above. The hourly distribution of cases has usually followed a similar pattern every year, with a peak at 2200 hours local and a trough around 0900 hours local. Since most UFOs are nocturnal lights, most sightings will occur during the evening hours. Since the number of possible observers drops off sharply near midnight, we would expect the hourly rate of UFO reports would vary with two factors: potential observers and darkness. The category of Duration is interesting in that it represents the subjective length of time the UFO experience lasted. In other words, this is the length of time the sighting lasted as estimated by the witness. Naturally, these times are greatly suspect because it is known that most people tend to badly misjudge the flow of time. Although an estimate of "one hour" may be in error by several minutes, it is unlikely that the true duration would be, for example, one minute. Furthermore, there have been cases when a UFO was observed and clocked very accurately, so that we can be reasonably certain that UFO events can last considerable periods of time. The average duration of UFO sightings in Canada in 2012 was about 15 minutes, down from about 22 minutes in 2011 but comparable to 2010, when the average was 16 minutes. These significant lengths of time suggest some simple explanations. Previous analyses have shown that long-duration sightings tend to occur in the early morning hours, from about midnight until 6:00 a.m. The duration of a sighting is one of the biggest clues to its explanation. Experience in studying UFO reports has shown us that short duration events are usually fireballs or bolides, and long duration events of an hour or more are very probably astronomical objects moving slowly with Earth’s rotation. In cases where colours of an object were reported by witnesses, the most common colour in 2012 was orange, similar to 2011. The next most common colours in those years were white, red and “multi-coloured.” Since most UFOs are nocturnal starlike objects, the abundance of white objects is not surprising. Colours such as red, orange, blue and green often are associated with bolides (fireballs). Orange is most often associated with the observation of a Chinese lanterns, the launching of which became popular during the past few years. The ‘multicoloured’ designation is problematic in that it literally covers a wide range of possibilities. This label has been used, for example, when witnesses described their UFOs as having white, red and green lights. Many of these are certainly stars or planets, which flash a variety of colours when seen low on the horizon. Aircraft also frequently are described as having more than one colour of light, such as flashing coloured wing lights. However, seen from a distance, aircraft will often be visible only as moving white lights. The average number of witnesses per case between 1989 and 2012 is approximately 2.00. This value has fluctuated between a high of 2.4 in 1996 to as low as 1.4 in 1990. In 2011, the average number of witnesses per case was 1.74, and the value in 2012 remained about the same, at 1.79. This indicates that the typical UFO experience has more than one witness, and supports the contention that UFO sightings represent observations of real, physical phenomena, since there is usually at least one corroborator present to support the sighting. 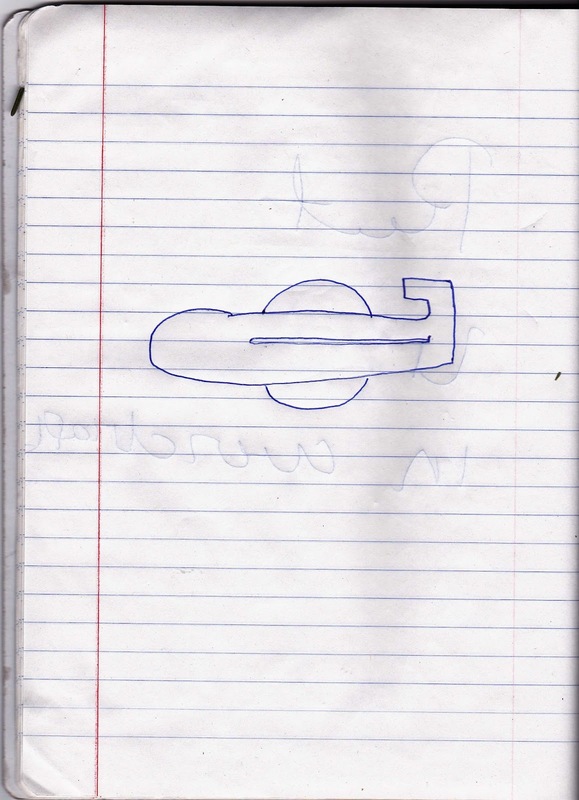 Witnesses’ descriptions of the shapes of UFOs vary greatly. In 2010, about 45 per cent were of “point sources”—that is, “starlike” objects or distant lights. In 2011, this number was significantly greater, at 56 per cent, and in 2012, the ratio was about the same, at 55 per cent. The classic “flying saucer” or disc-shaped object comprises only around three or four per cent of all UFO reports, contrary to popular opinion. Even the “triangle” shape, which some ufologists have suggested has supplanted the classic “saucer,” is only a small percentage of the total. The average strangeness rating for UFO reports during 2012 was only 3.21, down slightly from the 2011 average of 3.35, where 1 is considered not strange at all and 9 is considered exceptionally unusual. Most UFOs reported are of objects which do not greatly stretch the imagination. Hollywood-style flying saucers are, in reality, relatively uncommon in UFO reports. The overall Strangeness rating of Canadian UFO reports has been sliding slightly over time. The average Reliability rating of Canadian UFO reports in 2012 was 4.6, down significantly from an average of 5.1 in 2011. In most years, there are approximately the same number of higher quality cases as those of low quality. However, in 2012, more reports had minimal information on the witness, little or no investigation and incomplete data or description of the object(s) observed. Higher reliability cases include actual interviews with witnesses, a detailed case investigation, multiple witnesses, supporting documentation and other evidence. Since data for many cases are taken from websites and second-hand postings, or in fact self-postings, there is usually no significant investigation of UFO sightings. Well-investigated cases likely comprise only a small fraction of all UFO data, a fact that makes posted UFO case data have limited value. With the number of well-investigated cases declining, it is not at all surprising that the Reliability rating has declined overall. The lion’s share of reports used as data came through Sightings.com, which has been relaying UFO cases reported through the former Houston, BC, Centre for UFOs (HBCCUFO), with about 32 per cent in 2010 and 35 per cent in 2011, but up to 45 per cent in 2012. This is a very popular website found through Google searches, and many people rely on it for UFO information and submit their reports there via a web form. In 2011, about 15 per cent of the total cases were obtained through the private and non-profit National UFO Reporting Center in the USA, but this went down dramatically to nearly eight per cent in 2012. NUFORC has a toll-free telephone number for reporting UFOs and a large sightings list created through voluntary submission of online report forms by witnesses. About 23 per cent cases were reported to the large organization known as the Mutual UFO Network (MUFON), which has an efficient reporting system. This was a large increase from only nine per cent in 2011. Less than one per cent of all cases came as a result of information obtained through Transport Canada and the Department of National Defence. It should be noted that the preparation of this Survey is becoming quite challenging. Few UFO investigators or researchers actually submit case data to UFOROM anymore, requiring considerable searching of online sources. And, although many sites post information about UFO sightings, very little actual UFO investigation is being conducted. In fact, it could be said that the science of UFO investigation has nearly become extinct. This does not bode well for an area of study that is under constant criticism by debunkers wishing to prove the unscientific nature of the subject. It is worth considering the Sources as a way of trying to explain the large increase in reports in 2012. Since the percentage of UFO cases from various Sources has remained consistent, the dramatic increase is not due to an increase in reports from one particular Source. Therefore, it is reasonable to suggest that the increase in report numbers in 2012 is due to an actual increase in the overall number of reports across Canada. The breakdown by Evaluation for 2012 cases was similar to results from previous years. There were four operative categories: Explained, Insufficient Information, Possible or Probable Explanation, and Unknown (or Unexplained). It is important to note that a classification of Unknown does not imply that an alien spacecraft or mysterious natural phenomenon was observed; no such interpretation can be made with certainty, based solely on the given data. An Evaluation is made subjectively by either or both the contributing investigators and the compilers of this study. The category of Unknown is adopted if there is extensive information or data available and/or if the contributed data or case report contains enough information such that a conventional explanation cannot be satisfactorily proposed. This does not mean that the case will never be explained, but only that a viable explanation is not immediately obvious. Cases are also re-evaluated periodically as additional data or information is brought to attention or obtained through further investigation. The level and quality of UFO report investigation varies because there are no explicit and rigorous standards for UFO investigation. Investigators who are “believers” might be inclined to consider most UFO sightings as mysterious, whereas those with more of a skeptical predisposition might tend to subconsciously (or consciously) reduce the Unknowns in their files. The slight decrease in the percentage of Unknown cases is due to an increase in the number of reports considered to have Insufficient Information or had Possible Explanations. Again, this is related to a need for more well-investigated reports. In 2012, the percentage of Unknowns was just 7.47 per cent, the lowest ever recorded. There were 148 Unknowns out of 1981 total cases in 2012. If we look only at the Unknowns with a Strangeness of 6 or greater and a Reliability rating of 6 or greater, we are left with only 17 high-quality Unknowns in 2012 (less than one per cent of the total). This is much lower than previous studies, where values closer to three or four per cent were noted. As a comparison, USAF Blue Book studies found three to four per cent of their cases were "excellent" Unknowns. As it is, these 17 cases can be reduced further by eliminating those in which investigation is not complete or details not made available for outside evaluation. The interpretation of the 148 Unknowns in 2012 is that these cases were among the most challenging of all the reports received. It should be noted that most UFO cases go unreported, and that there may be ten times as many UFO sightings that go unreported as those which get reported to public, private or military agencies. Furthermore, it should be noted that some cases with lower reliability ratings suffer only from incomplete investigations, and that they may well be more mysterious than those on the list of Unknowns. And, above all, these cases are not proof of extraterrestrial visitation. The increase in the numbers of UFO reports with time likely does not have a simple explanation. It could be related to a growing awareness within the general population that there are agencies which collect UFO reports. It could be that there really are more UFOs physically present in the sky. It could be that the collection of UFO data is becoming more efficient. It could be that there are more private websites allowing or inviting people to report their UFO sightings. While media have been noted as playing a definite role in UFO waves (a national increase in UFO sightings), media coverage of UFO reports has significantly declined over the past decade while the number of reports has risen. Furthermore, the Internet as a reporting tool for anonymous witnesses is firmly entrenched; one likely cannot claim that an increase in Internet use is to blame for the increase in UFO reports. Also, there was no comparable UFO-related media phenomenon such as The X Files on television in 2012. The media did not seem to have had any greater influence over UFO reporting this past year as years before. Perhaps a cultural factor is at work as well, where “aliens” and UFOs are now well-entrenched within the societal mindset and are accepted as more probable than fiction. The question of why UFO reports persist when the scientific community is decidedly against the existence of a real phenomenon is itself is deserving of scientific study. It is likely that an increase in the number of Chinese lanterns sent aloft during celebrations in 2012 led to many of the “orange orb” reports. This, combined with a general lack of familiarity with the night sky, would no doubt have taken into account many of the UFOs reported. It is the more anomalous reports that seem unexplainable are worth pursuing as a way of understanding the UFO phenomenon as a whole, and the nature of human fascination with the subject of aliens and life in the universe. The following are those Canadian UFO reports in 2012 which had a Reliability Rating of 6 or greater, a Strangeness Rating of 6 or greater and which were also assigned an Evaluation of Unknown, and for which details are available for evaluation. Two witnesses watched a triangular black craft with pink lights on its wingtips pass overhead slowly and silently. When it was directly overhead, the object’s underside looked like a large bright ball of white light. It flew around the town in an arc, reversed course and eventually flew off to the north over the treetops. The sighting lasted about five minutes. A couple driving on a road in an isolated part of the city was shocked to encounter a black, flat, octagonal object with flashing lights. After they drove directly underneath it, it moved across a field and away from them. 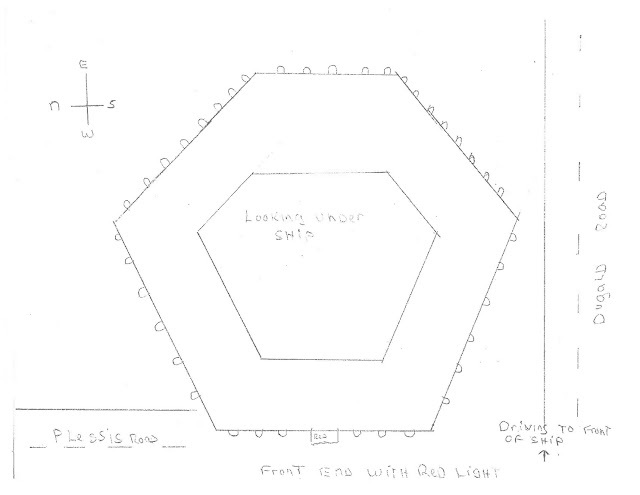 A witness observed an object shaped like a “huge dradle” with red lights. A loud roaring sound was seen while it was in view. It moved smoothly out sight. Two witnesses saw two dark objects “shaped like guitar picks” moving silently overhead at an estimated 200 feet high, heading east. 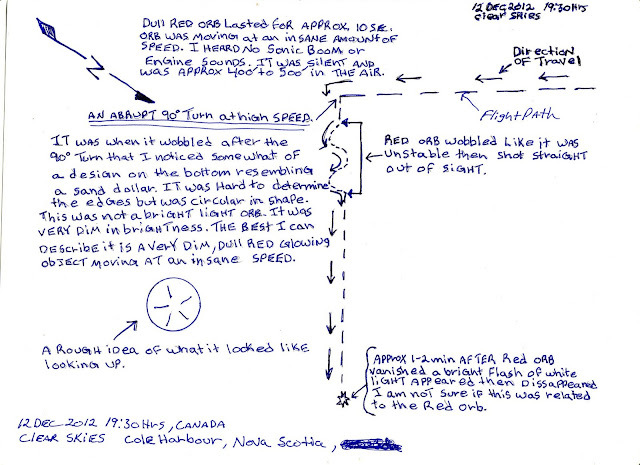 Two witnesses observed a flat, disc-shaped object with red lights around its perimeter. As it flew it in horizontal flight, it turned on its side and then darted towards the witnesses’ vehicle, then vanished before their eyes when it was within five metres of them. 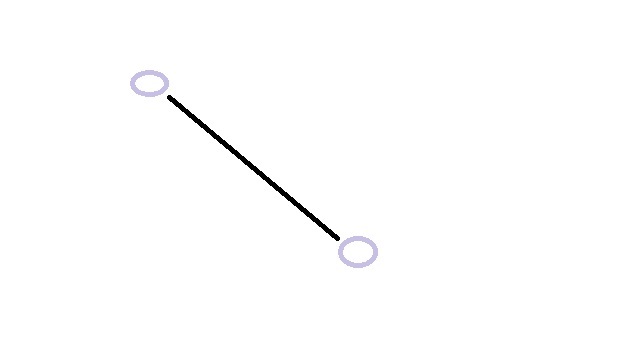 An object composed of three rings in a triangle approached the witnesses while they were driving. It flew overhead and then disappeared. As they drove further, the witnesses felt something touching or poking them, but could not see anything. An airline pilot was watching the sky and saw an odd orange light moving SW across the sky. As he watched, it faded, revealing a triangular object without any lights, rolling back and forth as it flew. A large square object with more than 30 multicoloured lights hovered over the ocean, moved from side to side and then in an arc. It was described as a “giant lit up billboard floating in the sky.” It made “rounds” for 10 minutes before vanished from sight. 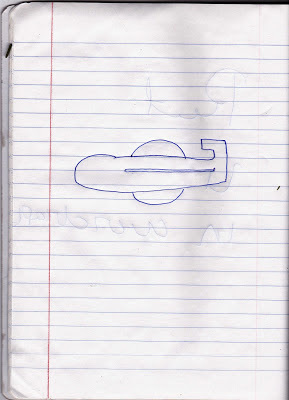 A silver “airplane” was seen flying low over a residential area. It proceeded to change its shape, from that of an airplane to a “musical triangle,” a “bird’s foot,” a “spinning bangle” and a “snow cone.” It was in sight for about 30 seconds before it was lost behind some trees. An object like a bright “neon green hexagon” suddenly appeared only 20 feet away from a witness. It remained motionless and silent, appeared to split in 2 sections then reformed. When the witness went to get someone else to see it, it vanished. A pulsating “orb” moved over a witness as he drove, the UFO’s pulses illuminating its body: a large rectangular object that had a “shimmering” appearance. Four people saw a disc-shaped, glowing orange object flying west to east across the sky, then stop suddenly in mid-flight. After about 10 seconds, it resumed its flight and went out of sight. A humming noise was heard, then a disc-shaped object with red and white lights moved into view between two farmhouses. It shot into the air, dropped down again, rotated to reveal a different colour and set of lights and headed off in the direction from which it came. Three witnesses observed an object something “twirling” above a field in an industrial area. After watching it for three minutes, one filmed it with his iPhone as it moved away towards the west. One bright light appears holds and gets brighter. the light moves into the distance flashes and disappears. the light comes back in the identical position. Something flashes beside the first light. it flickers and an identical light shows up. Flashes of light like explosions light up the sky the second light joins the first and flys away very fast then just gone. Thanks for this, charger. About how long did this go on for?